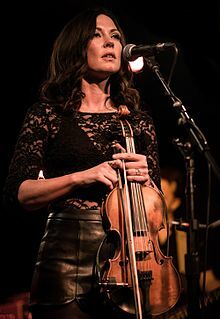 Amanda Shires (born March 5, 1982) is an American singer-songwriter and violin player. She has performed as a member of the Texas Playboys, Thrift Store Cowboys and Jason Isbell & the 400 Unit, as well as in a duo with Rod Picott. Shires has released six solo albums, her most recent To The Sunset on the Silver Knife label in 2018. Following her parents' divorce, Shires' childhood was divided between the Texas cities of Lubbock and Mineral Wells. She acquired her first violin at the age of ten from a pawn shop in Mineral Wells. At the age of 15 she joined the Texas Playboys, the former backing band for Western swing legend Bob Wills. She is distantly related to noted photographer Erica Shires, who produced the video for the song "Swimmer". Shires released her first solo album, the mostly instrumental Being Brave, in 2005. Four years later, having relocated to Nashville, she released West Cross Timbers and in the same year released Sew Your Heart with Wires, a collaboration with Rod Picott. Her next solo album, Carrying Lightning was released in 2011, followed by Down Fell The Doves in August 2013 and My Piece of Land in September 2016. The latter proved to be Shires' breakthrough, gaining her a nomination from the Americana Music Association. Since 2006 she has toured extensively with Picott. She has also performed and recorded with Jason Isbell & the 400 Unit, Devotchka, Chris Isaak, Thrift Store Cowboys, Todd Snider, and Justin Townes Earle. In 2011 she appeared in the movie Country Strong as one of the musicians backing singer Kelly Canter, played by Gwyneth Paltrow. Shires won the Emerging Artist of the Year Award at the 2017 Americana Music Honors & Awards. In 2017, she supported John Prine on his worldwide tour alongside joining Isbell for select dates. In 2018, Shires announced that she was working on a new album, To The Sunset due for release on August 3, 2018 which, like My Piece of Land, will be produced by Dave Cobb. Isbell revealed on Twitter that Gillian Welch and David Rawlings will make a guest appearance. As a member of the 400 Unit, Shires won the Grammy Award for Best Americana Album for The Nashville Sound. Shires contributed to The Tree of Forgiveness, the 2018 album by John Prine. To The Sunset was released on August 3, 2018. In 2011, Shires began earning a Master of Fine Arts in Poetry at Sewanee: The University of the South, a small liberal arts University in Sewanee, Tennessee. She graduated with her degree in 2017. Shires began dating fellow musician Jason Isbell in 2011. The couple married on February 23, 2013 and had their first child, Mercy Rose, on September 1, 2015. David Menconi of the magazine Spin said that Shires "sings [...] like an earthbound Emmylou Harris", and her vocals have been likened to those of Dolly Parton. The imagery in her songwriting has been compared to that of Tom Waits. Although her principal instrument is the violin, she also plays the ukulele. The song "When you Need a Train It Never Comes" from Carrying Lightning was ranked the fifth best song of 2011 by American Songwriter. ^ a b Dansby, Andrew (May 3, 2011). "Amanda Shires makes expressive connection". Houston Chronicle. Retrieved December 22, 2011. ^ Cornell, Rick (September 2009). "Amanda Shires, September 2009". Country Standard Time. Retrieved December 22, 2011. ^ a b Salamon, Jeff (May 2011). "Amanda Shires" (free registration required). Texas Monthly. Retrieved December 22, 2011. ^ Conway, Alanna (June 24, 2011). "Amanda Shires, 'Swimmer' – Video Premiere". Retrieved April 5, 2012. ^ Cooper, Peter (July 3, 2011). "Rod Picott and Amanda Shires stay in sync as touring partners, couple". The Tennessean. Retrieved December 22, 2011. ^ McCall, Tris (April 22, 2011). "Singer and violinist Amanda Shires to appear in Asbury Park". The Star-Ledger. Retrieved December 22, 2011. ^ a b Menconi, David. "Amanda Shires, 'Carrying Lightning'". Spin. Retrieved December 22, 2011. ^ Kerns, William (July 25, 2012). "Happily engaged Shires makes return appearance in hometown". Lubbock Avalanche-Journal. Retrieved February 25, 2013. ^ "Amanda Shires Isbell on Twitter". Twitter. Retrieved 2015-11-17. ^ Spevak, Jeff (19 May 2015). "Jason Isbell: The craft of sadness at Water Street". Democrat & Chronicle. Retrieved 1 June 2015. ^ Isbell, Jason (1 September 2015). "jasonisbell on Istagram: "Today"". Instagram. Retrieved 1 September 2015. ^ Caligiuri, Jim (November 25, 2011). "Amanda Shires - Music Review". Austin Chronicle. Retrieved December 22, 2011. ^ a b c "Amanda Shires, Texas Playgirl". Wall Street Journal. April 29, 2011. Retrieved December 22, 2011. ^ "American Songwriter's Top 50 Songs Of 2011". December 13, 2011. Retrieved April 5, 2012. Wikimedia Commons has media related to Amanda Shires.